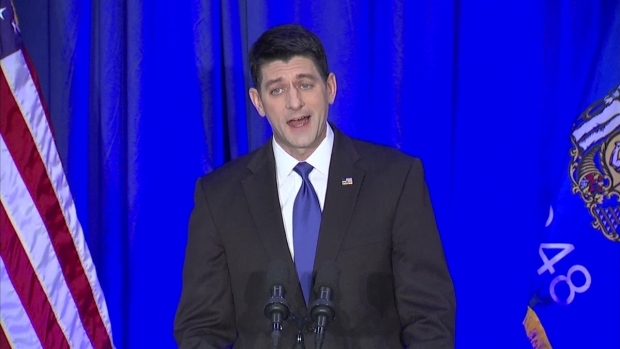 Speaker of the House Paul Ryan gave his farewell address at the Capitol Thursday. 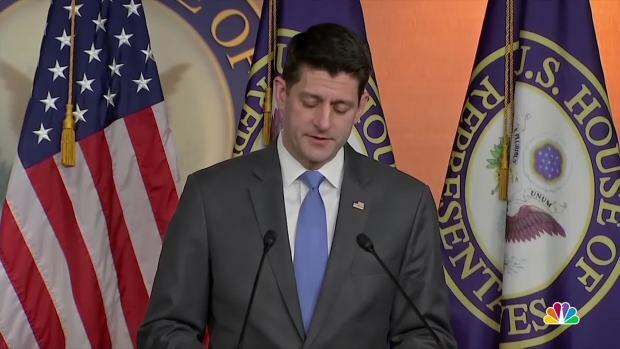 In his speech, Ryan struggled to answer how politics could become less divisive going forward and what would need to be done to improve civility among all. Retiring House Speaker Paul Ryan decried the outrage and bitterness that he said now color American politics in a farewell speech that also acknowledged his inability to achieve two top goals: controlling surging federal debt and reining in Medicare and other mammoth benefit programs. "Our complex problems are absolutely solvable," Ryan said at the Library of Congress, across the street from the U.S. Capitol, where he's ending two decades in the House. "That is to say our problems are solvable if our politics will allow it." The Wisconsin Republican's half-hour address, which touted achievements and admits shortcomings, came as he ends his three-year run as speaker. Despite GOP control of the White House and Congress the past two years, it's been a remarkably tumultuous period dominated by the erratic decision-making and verbal outbursts of President Donald Trump and Republican divisions over top issues like health care and immigration. Ryan's departure comes six weeks after an Election Day that saw Democrats capture House control. Their triumph followed a campaign in which they pummeled Republicans for trying to repeal and replace former President Barack Obama's popular health care law, a primary GOP priority. Ryan never explicitly mentioned Trump in his remarks. But he bemoaned the divisiveness that has been a hallmark of Trump's relentless, bitter denunciations of his political opponents, often on Twitter. "All of this gets amplified by technology, with an incentive structure that preys on people's fears, and algorithms that play on anger," he said. "Outrage has become a brand." He said the combativeness "pulls on the threads of our common humanity in what could be our unraveling," and he conceded that he didn't know how to fix the problem. Under Ryan, Congress approved the biggest tax cuts in decades, boosted defense spending and rolled back Obama regulations protecting clean air and water. But its attempt to scuttle Obama's health care statute crashed, annual federal deficits are surging and big-ticket entitlement programs are still unchecked. "We have taken on some of the biggest challenges of our time, and we've made a great and lasting difference in the trajectory of this country," he said, lauding Republicans for trying to tackle intractable issues like health care and immigration. 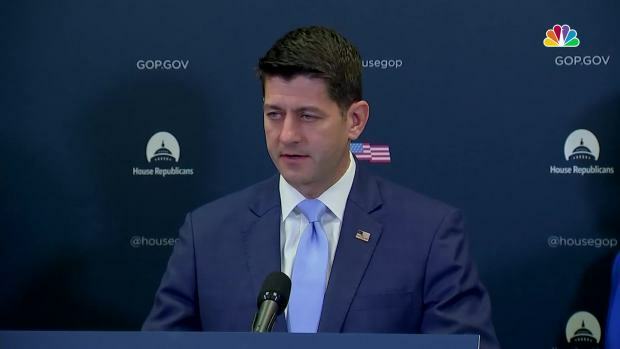 House Speaker Paul Ryan spoke in honor of former President George H.W. 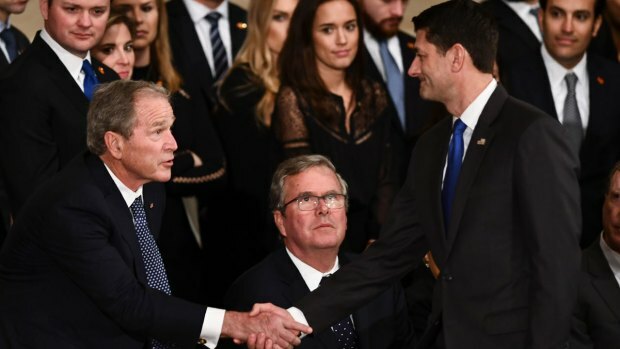 Bush at the U.S. Capitol in Washington. "I acknowledge plainly that my ambitions for entitlement reform have outpaced the political reality, and I consider this our greatest unfinished business," he said. He was Mitt Romney's vice presidential running mate in 2012 and became speaker in 2015 after conservative unrest prompted the abrupt resignation of his predecessor, John Boehner, R-Ohio. Ryan, 48, announced last April that he would not seek House re-election, saying he needed more family time. On immigration, Ryan said no matter how the border wall battle is resolved, "The system will still be in need of serious reform. And no less than our full potential as a nation here is at stake." Speaker of the House Paul Ryan said that President Donald Trump's threat to revoke the security clearances of former Obama officials was him "trolling people." He also said there was no chance of Russian President Vladimir Putin being offered the opportunity to address a joint session of Congress. In a departure from Trump's frequent anti-immigrant rhetoric, Ryan said a fix should include not just border security but also help for immigrants in the U.S. illegally to stay "and be a part of our American fabric." He said that should include "the undocumented population," a group estimated at around 11 million people — far more than were in play this year in a failed attempt by Trump and Congress to address the issue. Ryan was long a quiet force for broad immigration overhauls that conservatives opposed as going too far in offering citizenship to immigrants in the U.S. illegally. As speaker, he couldn't unify Republicans behind one approach. Resolving the problem would take "some of the venom out of our discourse," he said. On foreign policy, Ryan called for "committing to the pillars of international relations," a contrast with Trump's pillorying of NATO and withdrawal from some organizations. America must lead "not with bluster but with steady, principled action," he said. Ryan barely discussed last year's GOP tax cut bill, which he considers perhaps his most significant accomplishment. He cited that bill's tax breaks for investors in low-income communities and cautioned Republicans not to let efforts to ease poverty "drift from your consciousness." "It wasn't just the political reality. It was the failure of his leadership as the speaker to force that to be an issue," said David McIntosh. Defenders said Ryan led a House GOP that's bitterly divided between hard-right conservatives and more pragmatic lawmakers. "He unified a very fractious majority and kept it functioning," said Rep. Tom Cole, R-Okla.